It is a great honour to be asked to deliver the Carter Memorial lecture but since it is a ‘once in a lifetime’, requires careful thought before acceptance. The terms are interesting in that the lecture must be given twice: once to the Astrological Association and once to the Astrological Lodge of London. It must also be written up for the journal. As someone who makes full use of power point, the latter was always going to be a challenge! Several factors brought me to the decision to accept: firstly that the very first Charles Carter Memorial lecture was given on my birthday in 1970: as it happens a day I remember well. The happy events of that day are treasured memories. I noted too that on September 9th (when I would give the lecture at the AA conference) that Jupiter would make Libra ingress and that the following day would mark the last quarter phase of the Saturn-Neptune cycle. My Sun sits exactly on their midpoint. Since the cosmos seemed to be selecting me for the task, I then turned to the list of previous lectures to discover that three of the astrologers I greatly admire had given their Carter Memorial lectures with Jupiter in Libra. The most recent was Andre Barbault who was interviewed about the Uranus-Neptune cycle and globalisation. Mike Harding centred his lecture on the Saturn Neptune cycle. A Jupiter cycle earlier Jeff Mayo, whose Teach Yourself Astrology was the first book that I ever bought on the subject, gave his lecture on the Future of Astrology. It is interesting that we all have planets in early degrees of Libra. I focused on this to arrive at the title ‘The Elegant Universe’. At that time of choosing the title, I was captivated by the work of Hartmut Warm – not an astrologer but a master cosmic mathematician whose work on celestial signatures and the mandalas created by the planets is exceptional. The intricate pattern formed by successive Saturn Neptune cycles as viewed from Jupiter had me enthralled (fig 1.) The elegant simplicity of this mandala and the links I sensed between those earlier talks gave me confidence to progress. I knew then that I wanted to focus on potential developments in astrology between now and the next Saturn Neptune conjunction – in 2026, which is at 0 Aries and to which Jupiter’s position at 0 Libra on September 9th could be considered pointing. I wish, however, that I had studied the chart for the first delivery more closely. Neptune was rising and despite the fact that several rehearsals took place beforehand, I managed to omit a whole section – a situation put right when I re-delivered the lecture to the Lodge in October and inserted into this script. I gave some thought to Charles Carter himself and wondered what he would have thought both of my work and of where we are with astrology today. He was born on 31 January 1887 with a large stellium in Aquarius in which the Sun was at 11° of Aquarius exactly trine my own. He was also born with Uranus at 12 Libra sitting within a degree of my solar position. Perhaps one of the things he would have enjoyed hugely would be the advances made by both amateur and professional astrologers with access to computers. I have no doubt that he would have enjoyed getting rid of the tedium of hand drawn charts and calculations and the exquisite bliss of being able to do very sharp and fast research. I see coming to a conference as gaining a fix. I attend many conferences during the course of the year – not all of them astrological. There are many reasons why I attend these: not always to deliver lectures. What I find is that when you are with like-minded people – your tribe – and whether or not that’s with traders, musicians or in this case astrologers, the connections – or re-connections act as a re-boot: a ‘fix’. Hopefully, at the conclusion of a conference we all have renewed enthusiasm and reignited passion. However supportive friends and relatives may be, there is nothing quite like being with those to whom you can speak and enjoy the shorthand of – in this case – astrological language. Charles Carter is likely to have agreed with me that conferences are essential. However wonderful social networking via the Internet is or can be, there is something very special about sharing physical space with those who share our love of astrology. I do wonder though if he would have been as exasperated as I am sometimes with the lack of annual co-operation with those from other disciplines. We have so much to offer one another. Far from scientists being ‘repelled’ by astrology, I suspect that many would be intrigued by it. This thought led me to reconsider the title. It ought, perhaps to have been our Electrical and Elegant Universe. Kinesiologists and others recognise that we are all bundles of energy with the potential to excite and energise one another. To do this, we need to be together. So, long live conference and thank you for being here and ensuring that the collective astrological energy is re-charged. No questions are permitted at the conclusion of the Carter Memorial Lecture which is intended to be thought-provoking. With that in mind I want to share with you information that is altering my astrological thinking and prompting me to question certain long-held thoughts about the interaction of the planets. I would like to begin by focusing on the ‘electrical universe’ and will return to the ‘elegant universe later. Charles Carter would surely have delighted in the increasingly valuable information that comes from NASA and other space agencies. We are learning far, far more about our solar system, our galaxy and beyond. Yet this surely must require us to take a fresh look at astrology too. Many of you will know that I have a fascination with the Sun. Its output is variable though, as yet, we do not know why this is so. Whatever your age, you haven’t lived through a sunspot cycle like the one we are experiencing today. You probably know that there is an 11.2 year sunspot cycle. In fact this is the average. Even with all the data collected over the last couple of hundred years, scientists cannot be sure when the present cycle will end and the next begin. These cycles are numbered. We are coming to the end of cycle sunspot 24. The next cycle sunspot 25 ought to start at the end of this decade but whether or not that’s in 2019, 2020 or 2021 we don’t yet know. The point about this is that each one of these cycles is quite different to the last. In any one of these cycles you could have as many as 200 sunspots at solar maximum. This most recent cycle has barely reached 100. In fact, numbers have fallen below 50. This is what helioseismologists call a quiet cycle. It is more than a little worrying that the next cycle (25) might contain no sunspots whatsoever. This has implications for terrestrial weather and thence for crop cycles. Yet for as much as the sunspot activity is quiet, the Sun’s energy is not actually diminishing. Indeed Dr Mike Lockwood in California has been measuring its magnetic power and discovered that it stronger by about 230% compared to the 1970s. It doesn’t take a huge stretch of the imagination to think that if the Sun is emitting this much stronger magnetic pulse, that that must affect each and every one of us. Indeed it has to affect every cell on earth. It seems too that this increase in energy from the core of the Sun is impacting the planets. From this, I have come to the conclusion that some of our definitions: those that we associate with particular planetary line-ups, no longer work quite as they have done in the past. If it is indeed the case that the planets themselves are altered and radiating or emanating a different kind of vibration then all of that can be better understood. Consider these facts about our solar system: in the last few decades the Moon has been growing an atmosphere. Apparently there is now a layer of natrium about 6000 km wide. Mercury’s magnetic field is definitely increasing whilst the aural brightness on Venus has increased over 2500%. The ice caps on Mars are melting and there is a 200% increase in the brightness of Jupiter’s colours. Apparently there are x-rays now emanating from the centre of Saturn and increased brightness on Uranus. By the way: scientists used to describe the atmosphere on Uranus as calm. That has changed. Neptune is apparently 40% brighter than it once was and Pluto – whether or not you want to regard it as part is a planet in our system – has seen a 300% increase in its atmospheric pressure. It is worth while taking a moment to reflect on the developmental changes to our respective ruling planets. I also want to talk just for a few minutes about where the solar system is and where it’s headed. Our solar system sits right at the edge of the Milky Way. Apparently not too far from this there is a glowing and growing plasma. Nobody actually knows exactly what that is, but what we do know is that it’s over 1000 times brighter now than it was. Clearly our solar system is now passing through an area of space that is infinitely more energised than the one that was we were passing through when the first Carter Memorial lecture was delivered. Many of us were born pre-that lecture and, at least in these physical bodies, arrived when the solar system was moving through an area of space that was significantly quieter to the one experienced today. Colleagues and friends that I’ve spoken to in the course of the last year have consistently – and without being led – come out with statements such as ‘there’s a very weird energy around’. They may be correct. Those born post-1989 (the most recent solar retrograde) arrived under very different space conditions. My experience so far suggests that these people are experiencing the arrangements of the planets very differently to the way in which earlier generations have done. From my perspective, this group are set up to cope with a completely different voltage – which is confusing and, at times, perhaps even repellent, to some older astrologers. In recent times social, economic and political developments across the world have been put down to the Uranus- Pluto square – which must surely play its part. It may be that the position of these two planets relative to the Sun and how the Sun is impacting on their relationship is key to the apparently high-voltage energy apparently at work. I think though that conditions in the space through which our system is travelling should also be considered. If you leave with nothing else from today’s lecture then please do research solar activity at your birth. If you were born on a day of low sunspot activity, then perhaps you can cope better with the diminishing sunspots of the present but if you were born during a period of high activity then you could experience the coming years as more challenging. I know this is all away from the planets and our usual horoscope that I do think it’s something that we could discuss further and certainly perhaps even get astrophysicists in to discuss this with us. Certainly I am sure that dialogue with those from other disciplines is long over-due. I am confident that we have as much to offer today’s molecular biologists as they do us. If Charles Carter were alive today, he would advocate the same. Certainly his chart suggests a scientific and enquiring mind. The universe may well be super-charged, yet it is also a place of great elegance. The mathematical relationship of the cycles of the planets – and the Sun and Moon – results in the exquisite precision we can appreciate when looking at the planetary mandalas created by Hartmut Warm. In Mike Harding’s superb work ‘Hymns to Ancient Gods’ he devotes a chapter to the Saturn –Neptune cycle. Within this he refers to the building of cathedrals whose construction coincided with key phases in this cycle. The architectural elegance of these amazing structures might be described as offering a ‘frozen music of the spheres’. The geometry of these structures is mesmerising and fantastic and sometimes – as with Chartres Cathedral – pays obvious homage to the cycles of the planets. Long before these structures came into being though there must have been idea: a seed of thought that was eventually celebrated by their consecration. The grandiosity of these designs leads me to wonder if a transiting Jupiter – perhaps at the midpoint of Saturn and Neptune might have been involved. I wondered next what idea might be planted now – with Jupiter at zero degrees of a Cardinal sign, drawing attention to these important degrees and perhaps signalling the Saturn-Neptune conjunction of 2026 at 0 Aries. Between now and then, and at the December solstice in 2020, Jupiter and Saturn align at 0 Aquarius – arguably the sign associated with astrology. Where will our astrology be by 2026? Is it possible that, as Charles Carter might have done, we will have crossed an astrological frontier? Will our interpretations take into account the condition of the solar system and physical changes to our planets? Will we still be using the same keywords? Will our charts show the condition of the Sun at birth? 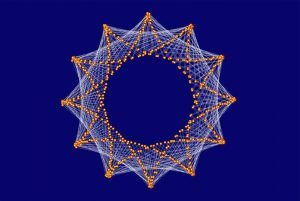 Is it possible that we might also leave behind the 2-dimensional charts with which we are so familiar but which surely, in this high-tech age could be replaced by something offering greater perspective? For example, if you want to purchase a house, you no longer look at just photographs or floor plans, the internet allows a virtual reality: at the very least a 3D version and the ability to walk through the structure at your own pace guiding a video camera as you do. Perhaps we ought to be asking our astro-programmers to develop something similar? We could then see at a glance whether or not a planet is truly rising, or is, owing to declination, actually nowhere near another planet or angle. We could also experience the relationship of the so-called ‘Fixed’ stars with the planets. Is it possible that by 2026 we will be able to wear glasses that allow us to experience charts quite differently and that might permit us to experience the cosmos as it really was at that special moment: not just revealing the position of the planets but the energy of that part of space through which the solar system was then travelling? Those who know me will know that I am not a fan of Jupiter transits. Like the genial host who keeps filling our glass oblivious to rising levels of intoxification, Jupiter offers so much – but not always coherently. At the conference in Wyboston I showed an image of air traffic controllers with hands in the air as two planes looked close to collision from just beyond their window. Close inspection shows that their radar screens show a live baseball match and that they were presumably cheering the score – oblivious to the potential devastation in the skies just beyond. Hartmut explores the rhythms of gravitational interaction and enchants with the quite exquisite and kinetic geometric shapes created by the planets as they orbit the Sun. It is, of course, not uncommon for astrologers to research these same cycles – usually over a period of a few hundred years and correlating the various phases of each with recorded history. Hartmut reminds us that each cycle has a geometric connection to every other cycle and that the whole is hugely complex yet fantastically organised. The inter-connectedness of these various cycles is shown in the example of the view from Jupiter of sequenced Saturn-Neptune conjunctions. In fact, each of the patterns shown in Hartmut’s book is reminiscent of a crystal. My father – not an astrologer himself – but hugely respectful of those who held the view that there was a link between the stars, planets and human behaviour, held a belief system that ‘we are all one’ but that like radios, we each tune into different frequencies. I don’t find it difficult to imagine each piece of cosmic geometry as a crystal carrying a frequency that resonates with some more than others. Just as my brother and I learnt to tune our first transistor radios, I think it possible for us to tune into these frequencies provided that we know what to listen for. If this is the case, then my hope is that from the present Jupiter Libra ingress, through to the Jupiter-Saturn conjunction at 0 Aquarius, and on to the Saturn-Neptune conjunction of 0 Aries, that we who share the thought that ‘as above, so below’ will tune in to this resonance and by February 2026, (by which time Pluto will have made Aquarius ingress) transform and improve the quality of our work. At conference in 2016, I hope we can celebrate our Electrical and Elegant Universe.